BRANDON, MB — Today in Thompson, the President and Vice-Chancellor of Brandon University, Dr. Deborah C. Poff met Lovro Paulic, the General Manager of Vale’s Manitoba Operations to accept the company’s donation of $400,000 in support of the Vital Outcomes Indicators for Community Engagement for Children and Youth (VOICE) project. Brandon University is supported in this project through a $1 million-dollar peer-reviewed research grant from the Government of Canada, through the Social Sciences and Humanities Research Council of Canada, Community-University Research Alliances Program (SSHRC CURA). The University College of the North will share in the award and actively participate in the research activities. The project will also include individuals from Frontier School Divisions, Kelsey School Division and the School District of Mystery Lake. The research activities will be aimed at helping First Nations and Métis children and youth achieve educational and career success. Vale is a global mining pioneer that discovers and transforms the minerals that are essential ingredients in the products people use every day. Vale is the world’s second largest producer of nickel, with these operations based primarily in Canada. Canadian operations also produce copper, cobalt, platinum group metals, gold and silver. In Sudbury, Ontario and Thompson, Manitoba, Vale operates mine, mill, smelter and refinery operations; in Voisey’s Bay, Newfoundland and Labrador Vale’s assets include mine and mill operations. Vale employs about 6,000 people in Canada. The presentation was a special one for Sheryl Moose and her father Patrick Moose. 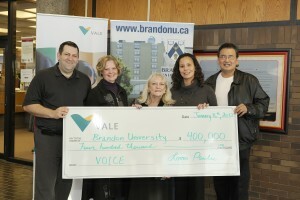 Sheryl, who is originally from Thompson, accepted Vale’s contribution on behalf of Brandon University. Her father, a 31-year employee of Vale Mining, presented Vale’s donation to his daughter.